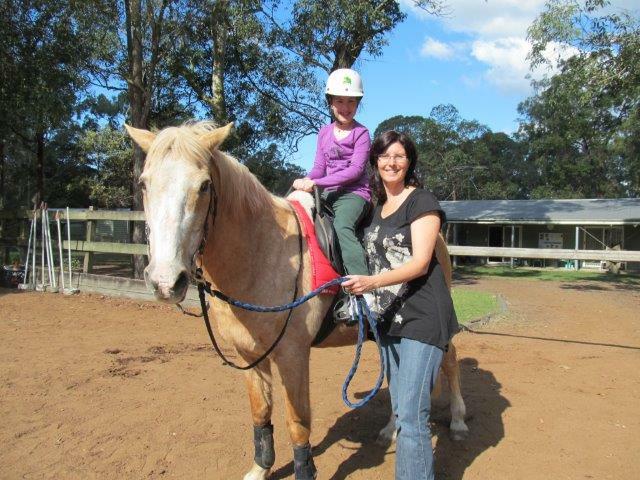 Mikayla has now been doing horseriding for 12 months and what a fantastic activity this has proven to be for her! Not only is it fun, but it naturally provides the kind of work out Mikayla’s body needs. Core strength, alignment correction to maintain an upright middle posture, balance, coordination, control, disassociation (working arms independently to legs and one side of the body separately from the other), multitasking (staying on the horse, perhaps steering and maybe even talking all at the same time!) right through to a nice big voice for commands such as “walk on”, “trot” and “woo”! Mikayla has great instructor who balances well her physical workout and horsemanship needs and lines it with just enough fun and laughter. These days as a bonus, I get a free work out too – running along beside her as a spotter! Mikayla has progressed in few key areas over the past 12 months. Her endurance has definitely improved with an increased ability to maintain her alignment on the horse in a nice upright posture. She has been able to do a trot, has improved in her ability to maintain herself while trotting and has even begun trying to do a rising trot ! Although her ability and stability does still fluctuate, there is no doubt that it is doing her good on a number of levels, and it is great to see her making improvements and setting herself (and her instructor) some goals for the future! Mikaylas own personal goal is to achieve greater independence on the horse, to be able to take control of the reins and steer independently, and one day she even wants to be able to canter! Physical benefits and the workout each session is for her aside, horse riding is a fantastic experience for her and I’m sure will be among her fondest childhood memories……..
We are thankful of the kind donations we have received towards helping with the cost of this therapeutic activity for Mikayla. It is a valuable part of both her therapeutic routine and an activity that she loves and looks forward to! This entry was posted in horse riding, progress, therapy and tagged Horse, Mikayla, progress, therapy on August 7, 2013 by mikaylasangels.